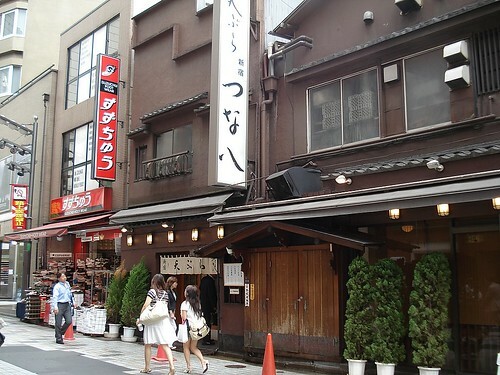 Tsunahachi flagship store at Shinjuku, originally uploaded by Camemberu. Made it early to Tsunahachi in Shinjuku for lunch. Just had to try this really famous tempura shop! This outlet is their flagship store, and is quite a pleasant place to dine. You can choose to sit at the counter to watch the frying action or sit at tables in the tatami section (which we did). 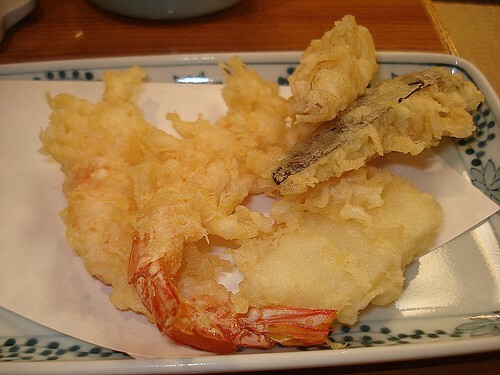 First serving of tempura selections (lunch set), originally uploaded by Camemberu. I went for their value-for-money lunch set (only ¥1,365) and hubby went for a slightly larger ¥2625 set. You can see more details on their menu. They have English menus too at the restaurant, but it does not show the ¥1,365 lunch set. The fried items are delivered fresh from the fryer onto your plates. You can see it is fairly light and not too greasy (hardly any oil stains on the paper). In addition to the dipping sauce, they give you three kinds of salt - plain, green tea and citrus (I think) flavoured. 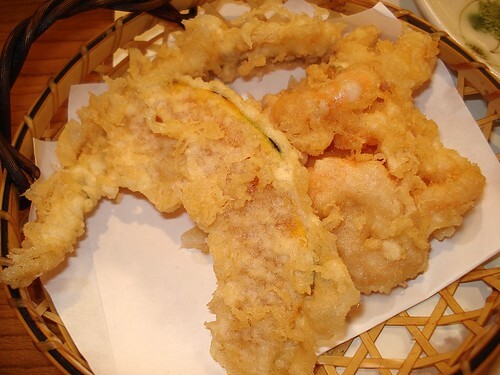 But the tempura is lovely enough to eat on its own. 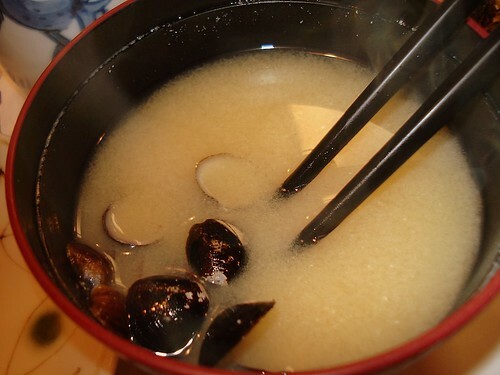 The miso broth comes with clams, lots of little clams!, originally uploaded by Camemberu. This is the most delicious miso soup I've had so far! Almost like a seafood soup, with lots of little clams flavouring it. 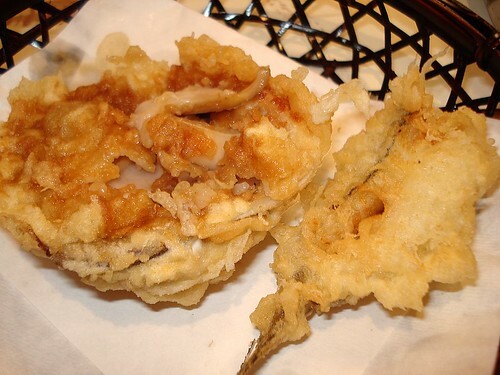 Second round of tempura items include a seafood-mushroom mix in a huge clamshell and a whole fried fish, originally uploaded by Camemberu. Hubby's portion had an interesting item that was a mixed seafood (scallops, clams, and whatnot) and mushrooms placed in a large clamshell and fried. Also a piece of white flesh fish. Some stewed melon (not sure what the orange stuff is), originally uploaded by Camemberu. This is probably like a palate freshener. 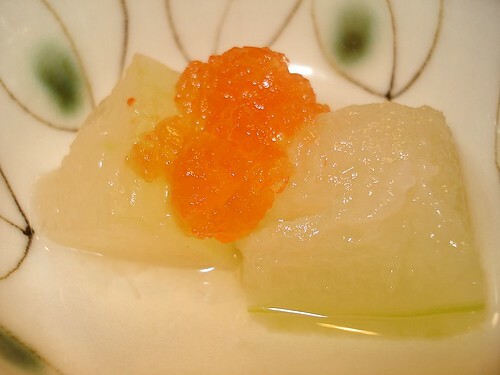 A small dish of cold, stewed melon. Quite refreshing. Seasonal vegetables, anago, shrimp kakiage, originally uploaded by Camemberu. The tempura comes in staggered batches, so you always get to enjoy them hot. However, by the time we reached the third or fourth serving (my pics don't show every item), it was almost too much fried stuff. The shrimp kakiage was also a little heavy (soaked up a bit too much oil?). Oh yes, rice and pickles are also served, so you can get a really full meal. Overall very satisfying but not as "wow!" as I had hoped for (I really blame my over-fantasizing about perfect tempura for this). It's still really good food at fantastic value, with great service to boot. Very pleasant place to dine.